I tend to get really thankful around Christmas. I guess I’m too busy thinking about pumpkin pie and watching the leaves turn at Thanksgiving or something. Of course, in reality, the reason I’m so excited to be home and so glad to spend time with my family and old friends is the fact that winter break gives me more time to enjoy their company. And with more time I get around to reminiscing, laughing, eating, and watching French films. I saw La vie en Rose, Aux Revoirs Les Enfants, Paris Je t’aime, Coco avant Chanel, and watched Ratatouille and Amelie for the fifth time. Now of course I know Ratatouille is a Pixar/Disney creation, just as I am well aware of the fact that Julia Child’s My Life in France was published in plain English. But I read and watched and loved both as though they were really French because both have that je ne sais quoi that invigorated my passion and hunger for life and my belief in romance. And as I sat there reading, with my stomach grumbling, I couldn’t think of a better way to bring France into my Californian world than to recreate a French recipe. 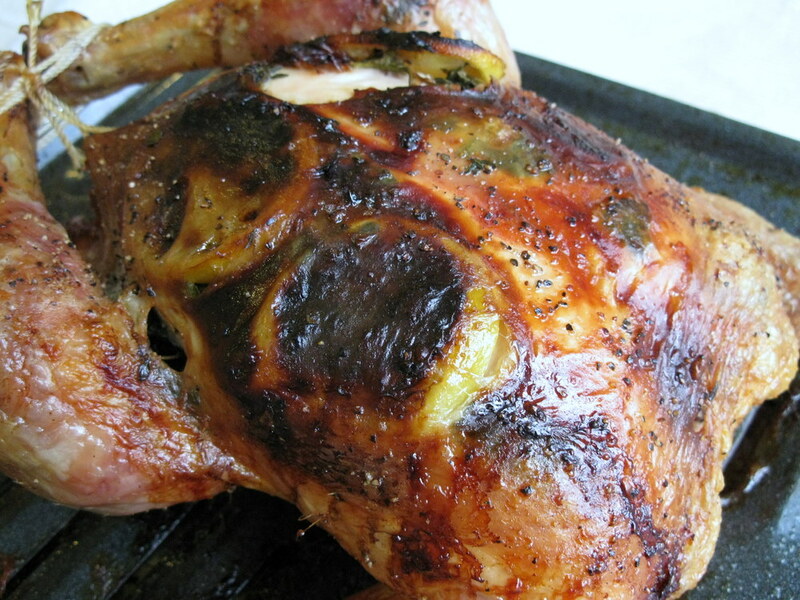 I’d been wanting to try my hand at roasting a chicken for quite some time–I’d never done it before and was nervous that I might undercook it and send my brother to the hospital with salmonella poisoning, so I did a little research to find the perfect recipe that would give me a flavorful, juicy chicken with a crispy skin, bacteria-free. When I saw the ingredients for “Roast Chicken Provencal,” I knew I’d found my mark. While I was scouring the internet for dish prep ideas, I came across rave reviews of Judy Rodgers’ roast chicken recipe featured in her restaurant in San Francisco, Zuni Cafe. I decided to marry the flavors of Provence to the style of Zuni’s bird and hoped I would get the chicken I’d been dreaming about for months. I was happy to discover that Rodgers’ directions were so simple they’d be difficult to mess up; the secret to a chicken with a crispy skin and tender flesh is apparently to just pat it dry and season it with salt and pepper a couple days in advance. Then you slit the skin in strategic spots and insert your herbs–they’ll release their flavors into the chicken during the roasting process. Since I’m a flavor freak, I tucked pockets of rosemary, sage, thyme, and marjoram underneath as much skin surface as I could manage without tearing the skin off the meat, which would make those “bald spots” prone to getting dried out in the oven. I also stuck five thin slices of lemon underneath the skin of the chicken breasts for a little extra zing and put my remaining fresh herbs, half a lemon, and half an onion into the chicken’s cavity–all deviations from the original Zuni Cafe recipe, but I just wanted a little extra insurance against the possibility of the chicken drying out in the oven. Results after the jump–although I imagine the picture here tells you enough about how it turned out! I decided a while ago that I was going to reward my four years of hard college work with a month-long vacation in France–and after this chicken and all the time I’ve spent thinking about France this winter break, I’ve set my plans into motion. Here’s to good eating, passion, romance, and France in 2010! 1. Rinse and pat the chicken dry, inside and out. Salt and pepper the outside of the chicken and the cavity. 2. With your finger, loosen the skin from the breasts and stick the herbs into the pockets. Make thin slices of the lemon and insert them underneath the skin as well, on top of the herbs so that the herbs are what’s touching the flesh. Set it on a roasting pan or rack and let it sit in your refrigerator for 1-3 days. 3. Preheat the oven to 475 degrees. Then take the unused portion of the lemon, any extra herbs you have, and half of an onion and stuff them into the cavity. 4. Roast it for 30 minutes, breast-side up. Then turn it over and roast it for 20 minutes. Turn it back over and re-crisp the skin for 10 minutes. If you find that the oven temperature is too high for your chicken, reduce it to 450. 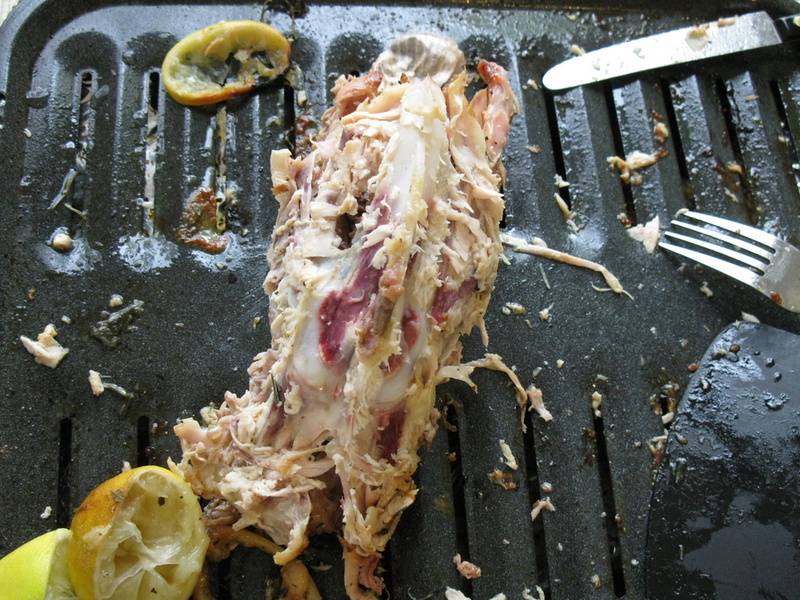 Cook your chicken until the thickest parts (thighs, breast) have an internal temperature of 180 degrees. Once the chicken is done, let it rest for 15 minutes before carving it. Looks delightful! I’ve just copy pasted your recipe on my notepad and I hope I can slip this on my wife’s recipe book in time for Mardi Gras. Thanks! Good for you! Where your chiken came from? What kind of bird it was? Did you raise her? Did you kill her? How? You know, France has lots of great vegetable recipies and you can use your own backyard to make them..